I almost looks like a moment of prayer. And square or not, Riley does look beautiful! How lucky you are to have such a nice collection of photos from that show. They will be a treasure in years to come when Riley is doing Grand Prix! Riley has the most lovely neck--and he's so built! Almost looks like a stud, what with all the muscling. Very nice set of photos of the both of you. Oh, Ri-Ri, you've both come so far! Love this picture! I feel so proud of you both. I am a relatively new follower and I LOVED your photo series. I agree with everyone's assessment of Riley--he is gorgeous. I also agree that you look great--but you need to SMILE more. That first photo of "both of you smiling" was great. Lovely picture you to make! 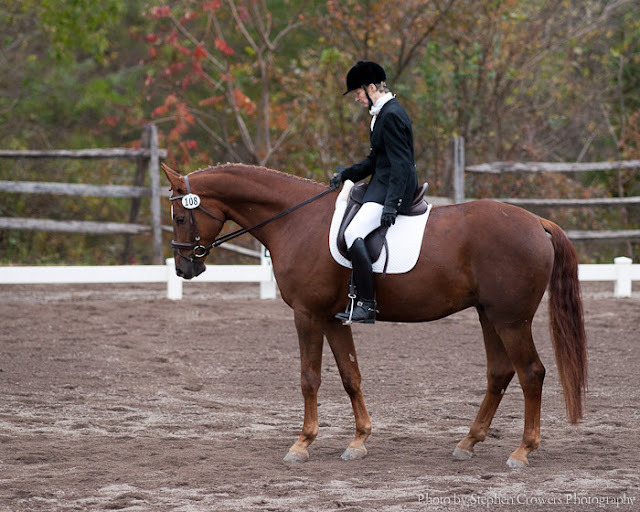 Do you have a brown dressage bridle?? Where did you find that? What a great, wonderful, relaxed expression he has! Love this photo, square or not!